In the 1960s and 70s, just about every town of any size in Scotland had a thriving folk club - filled, without fail, on a weekly basis with a strong chorus joining in with well known songs, and an addictive community spirit and camaraderie. Whilst those days may have long gone, they remain fond in the memory - as do the songs, and the artists who brought them to the length and breadth of the country. 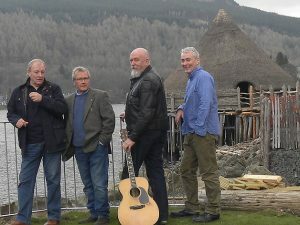 In a bid to ensure that the songs of the era do not disappear, Auld Hats New Heids brings together four of Scotland’s top folk singers and musicians to recreate the atmosphere of the folk club heydays for today’s audiences. Brothers Fraser Bruce (vocals) and Ian Bruce (vocal, guitar, mandolin) are joined by Pete Clark (fiddle) and Gregor Lowrey (accordion), with a setlist of old favourites and a formidable audience rapport - backed by a slideshow of many of the characters that drove the Scottish folk scene through the second half of the twentieth century.